Make the most of the summer term with Spain school adventure trips and watersports trips to the Mediterranean. Stay in our Premier Resort of Platja D’ Aro, Spain with its fabulous beaches and handy waterpark. 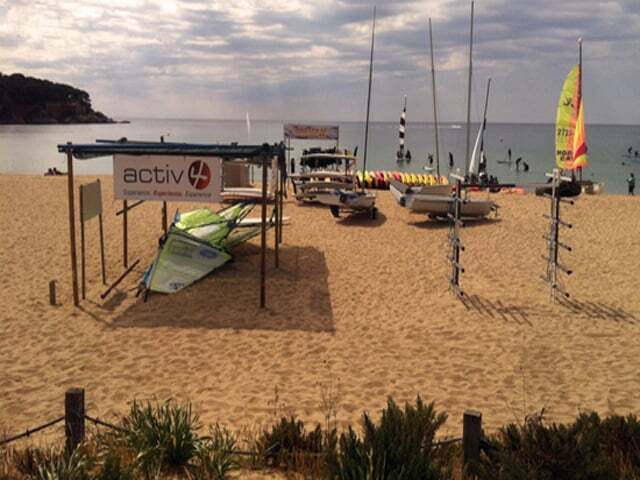 The Activ4 watersports programme on the Costa Brava in partnership with the renowned Escola de Vela & Kayak on the Blue Flag Sant Pol beach. You will depart from a UK airport bound for Spain. On arrival at the destination airport you will be greeted by your activ4 representative and transferred to the Caleta Palace hotel in the coastal resort of Platja D’Aro. Your rep will assist you with check in, ensuring all runs smoothly. Located right on the beach and with direct access to one of the most beautiful coves on the Costa Brava, the complex features great facilities which will help you enjoy your stay; including a swimming pool, sun terrace, internet area, games room, and a restaurant with buffet service and Mediterranean cuisine on the menu. 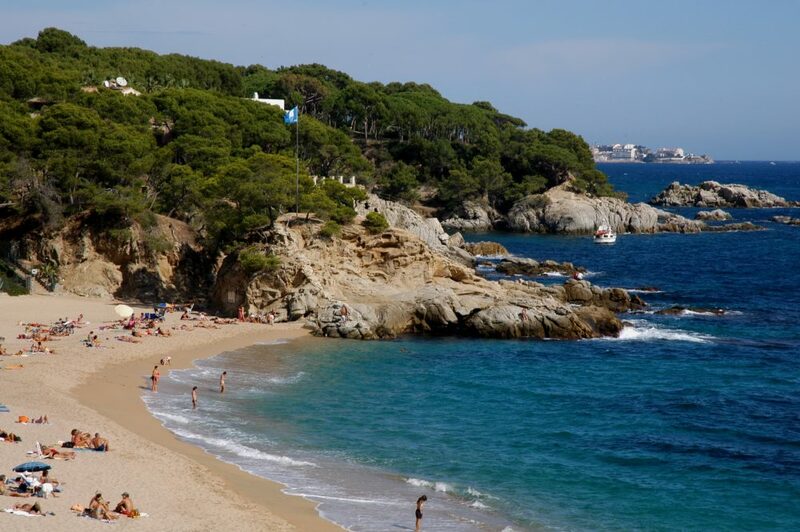 The wide, tree lined promenade has lots of sophisticated shops, restaurants and cafes which makes it one of the best resorts on the Costa Brava. School groups have been coming to the resort for twenty years which is testament to how much it has to offer. There is a room onsite as well as an outside terrace area to hold a variety of evening entertainments for which there are numerous options available, possibly starting with a quiz night. Each day will start with a buffet breakfast (huge variety, so no excuses for not eating breakfast!) before heading out for the day’s activities. Your water sport sessions begin this morning and will be at Sant Pol beach which is just a short transfer away. Your group will be escorted by a local activ4 representative to ensure things run smoothly. You will meet the instructors and begin with a full safety briefing from the beach-master. Groups will then be split and activities really get under way. Lunch will be back at the hotel unless you prefer packed lunches on the beach. The afternoon will be taken up by the second of the water sport activity sessions finishing in time for everyone to return to the hotel and prepare for dinner. As with all areas of activ4 programmes, evening entertainments will be carefully planned for your group and this evening you can walk into the centre of Platja D’Aro to one of the Indoor Activity Areas in Magic Park to spend the evening where you will find the latest simulator arcade games, bucking bronco’s and indoor dodgem cars. This really is great fun and just a short walk away. On the way back to the hotel why not call in at one of the many cafes to enjoy Churros con Chocolate! Today you could opt to set off on the short coach ride across the resort to the Aqua diver Water Park. This is one of the most popular attractions on the Costa Brava and there are a whole range of rides from the less adventurous Wave Pool, Rapid River to the adrenalin fuelled Splash Mountain and Black Kamikazi. The Water Park is a fun day out for both students and teachers and a great way to cool down when temperatures get high. There are lockers and showers available (extra cost) at the park as well as a picnic area for you to enjoy your packed lunch. Back over to Sant Pol beach to pick up where you left off with the water sports activities. This is one of the prettiest beaches on the coast; crystal waters and backed by lovely protected dunes. By the end of the day the students will have had the opportunity to participate in each activity and after an eventful day you will head back to the hotel. You may wish to end your tour by heading back into Platja D’Aro to party the night away with a disco at Gibb’s bar!